It's getting late, but the celebration's far from over. The crowd chants for more, and the band launches another wild Gypsy rumba. The horn players swap sizzling solos, and the dancers start shakin' it. It's another Saturday night with Balkanarama. We're among the leading North American interpreters of contemporary Balkan music, from ancient Romany ballads to modern Bulgarian video hits. We give them a flavor all our own on sax and clarinet with four soulful voices, powered by a nonstop dance beat on synth, bass and drums. 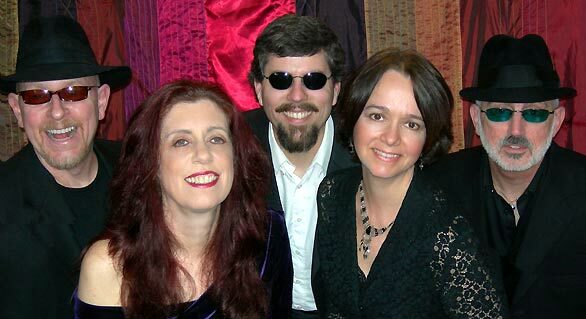 We've been arousing audiences at clubs, festivals, weddings and parties in the Pacific Northwest since 1997. With a repertoire of 100 songs, we can lay down a killer club set, present a formal concert or play all night for a Bulgarian wedding. We especially like introducing Balkan Gypsy party music to audiences who've never heard it before. Wherever we play, people get up and dance. And first-timers always join in, because we mostly play easy dances that anyone can pick up on the spot. Basic rock 'n' roll dancing works just fine. If you know the Seattle music scene, we've performed at the Crocodile Cafe, Rainbow Room, ToST, Porta Greek Taverna, Zig Zag Cafe, SecondStory Repertory, Cafe Solstice, Georgia's Greek Restaurant, Old Town Alehouse, Zoka, Crossroads, Mr. Spot's Chai House, Third Place Books and other clubs and venues -- here's a list. We've built a growing following among Seattle's emigre communities. We've appeared at Northwest Folklife, one of the largest traditional music festivals in the U.S., every year since 1997. We've also played at Seattle's most popular street festivals, including the Fremont Festival, University District Street Fair and Hempfest, and at Reed College and the University of Oregon. Balkanarama has released three indie CDs: a full-length recording, Nonstop, in 2000; a five-song demo, Black Sea, in a more modern style in 2002; and a live recording, Balkanarama Live, done in one take in 2006. Hear samples of all the songs on all our CDs. So, enjoy our multicultural feast! If you're looking for musical talent, check out our music, repertoire and where we've played. Then get in touch. Let's party!